We have a friend's wedding this weekend and I love that she's very much into handmade. I did invitations for her sister's baby shower a few years ago and I knew I had to make a card for her and her new hubby :) I don't know about you but wedding cards have to be one of the hardest style of cards for me to make. I did some Pinterest searching for ideas. Ever notice that embossing is a pretty standard thing for wedding cards? Card details: Measures 4-1/4 x 5-1/2. I embossed some whisper white cardstock using an old Cuttlebug embossing folder, added the natural ribbon, 1/2 a tea lace paper doily and stamped out the mr. & mrs. with Crisp Cantaloupe ink. I used Baked Brown sugar ink with a hostess stamp set and punched it out using the Decorative Label inch. I then added a very vintage button to finish off the card. I also matted the white embossed layer to some very vanilla cardstock and then mounted that to my whisper white card base. Supplies: Whisper White Cardstock (100730); Very Vanilla Cardstock (101650), Decorative Label Punch (120907), Natural Ribbon (127844), Tea Lace Doilies (129399), Very Vintage Buttons (129327), Crisp Cantaloupe Ink (131176), Baked Brown Sugar Ink (131174), Paper Trimmer (126889), Snail Adhesive (104332), Banner Greeting and Sweetly Framed Hostess Stamp Sets. New clearance rack items have been added to Stampin' Up! It's a great time to stock up on some oldies but goodies and save up to 80% off (while supplies last). Don't forget to use the new hostess code for this week and be entered to win. Last week's winner received $100 in free SU! products. Click Here to see clearance rack items. Great post Christina. 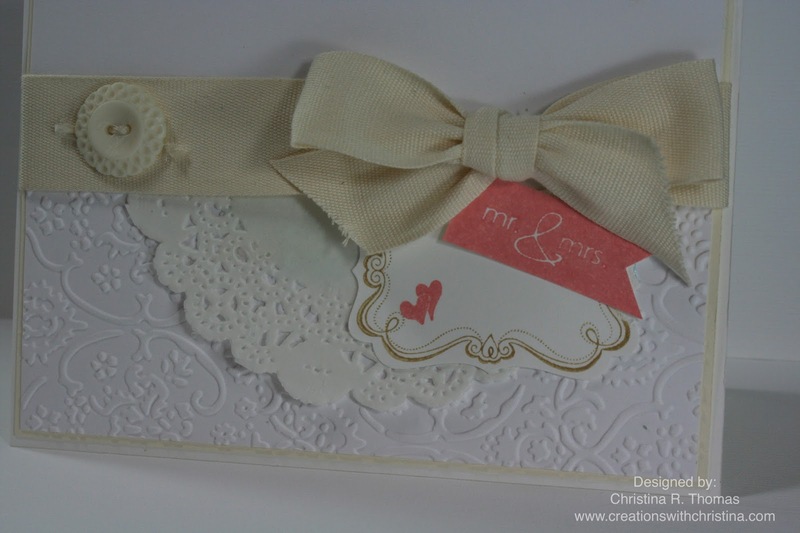 The white and cream colors combination of your invitation is perfect. 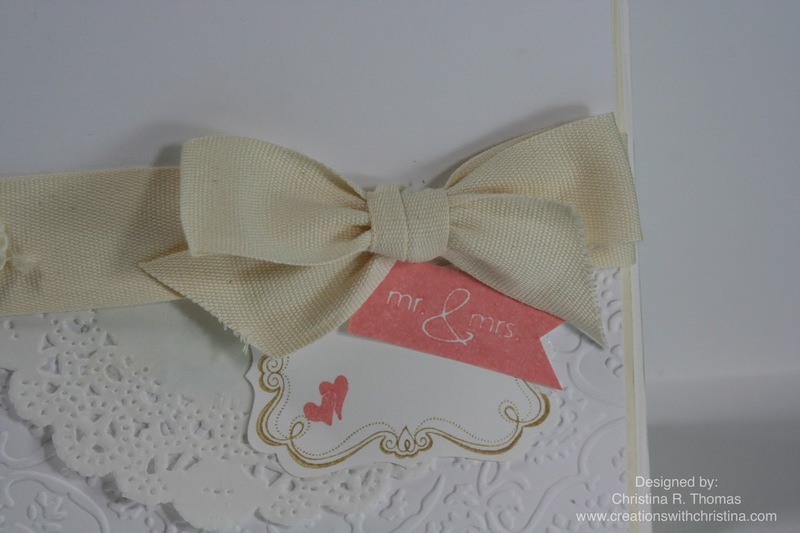 Even i appreciate your way of adding cream color ribbon and vintage button is giving an elegant look to this wedding invitation. I really liked it and it inspirational also. Thanks for sharing your beautiful creative work. Nice post! I like the wedding invitations. The color combination and texture style is really very wonderful. 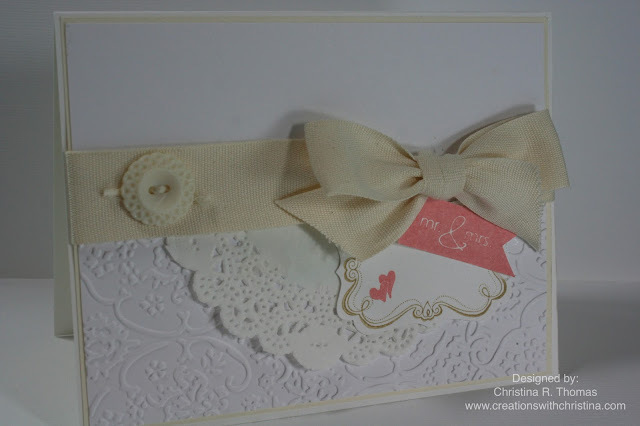 The water and cream color gives this card an attractive look. I love the unique way of adding ribbon and button on it which makes it more beautiful and stunning. I appreciate your inspirational and creative work. Thanks for sharing this information with us. I have ordered some Wedding Invitation Card through Online for my friend's wedding. Can you tell me is it nice or I ll go for other place? That's really nice one. I love the ribbon theme wedding invitations with nice color combinations and the design which you created make it perfect and seems unique as well.